The image of the stunned and weary-looking boy, sitting in an orange chair inside an ambulance, covered in dust and with blood on his face, encapsulates the horrors inflicted on the war-ravaged northern city. Photographs of the boy were widely shared on social media. An hour after his rescue, the building the boy was in completely collapsed. The fighting has frustrated the U.N.'s efforts to fulfill its humanitarian mandate, and the world body's special envoy to Syria on Thursday cut short a meeting of the ad hoc committee—chaired by Russia and the United States—tasked with deescalating the violence so that relief can reach beleaguered civilians. The U.N. envoy, Staffan de Mistura, said there was "no sense" in holding the meeting in light of the obstacles to delivering aid. The U.N. is hoping to secure a 48-hour pause in the fighting in Aleppo. A doctor in Aleppo on Thursday identified the boy as 5-year-old Omran Daqneesh. Osama Abu al-Ezz confirmed the boy was brought to the hospital known as "M10" on Wednesday night, following an airstrike on the rebel-held neighborhood of Qaterji with head wounds, but no brain injury, and was later discharged. "We were passing them from one balcony to the other," said photojournalist Mahmoud Raslan, who took the memorable photo. He said he had passed along three lifeless bodies before someone handed him the wounded boy. Raslan rushed him to the ambulance, he said. A doctor at M10 later reported eight dead, among them five children. The strike occurred during the sunset call to prayer on Wednesday evening, said Raslan, a correspondent for Al Jazeera Mubashir. 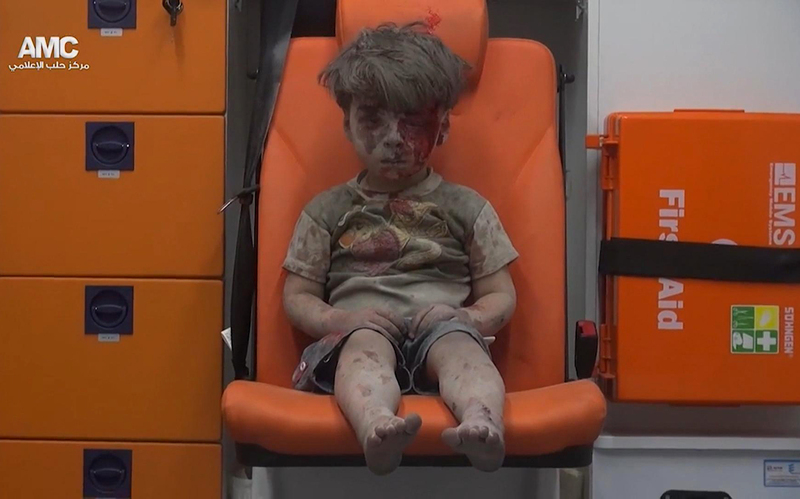 Omran was rescued along with his three siblings, ages 1, 6, and 11, and his mother and father from the rubble of their partially destroyed apartment building, according to Raslan. None sustained major injuries, but the building collapsed one hour after the family was rescued. A second building, next to theirs, was also heavily damaged. Rescue workers worked until 5 a.m. to retrieve a final victim from the rubble. The victim, who was not identified, survived.